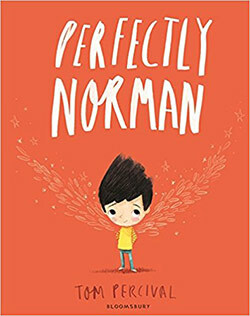 "Find the courage to be yourself"
Norman was a perfectly normal boy, until the day he grew an extraordinary pair of wings. Swooping high into the sky turned out to be, naturally, the MOST FUN EVER, and for a while life was joyous and carefree for young Norman. That is, until he started to worry about how other people would feel about his amazing wings. So he carefully tucks them under a big coat, out of sight of his friends and family. Norman starts to decline into misery, stifled in his thick coat and unable to join in with the other children’s fun and games. Following an emotional run-in with a bully, Norman has an epiphany: he realises that it is his coat, and not his wings, that is making him miserable. With some gentle persuasion from his parents, he casts off his coat and unfurls his beautiful wings, uninhibited and happy once again. His brave act emboldens his friends, and suddenly there are coats being discarded all around him and the sky is filled with delighted winged children. Norman has discovered that there is no such thing as perfectly normal, but he is perfectly Norman, which is ‘just as it should be’. This is a stunningly beautiful picture book with a heartfelt and uplifting message at its core. The story has been crafted with great love, care and thought by Tom Percival, who has perfectly captured Norman’s emotional struggles. Use of colour, or lack of it, is significant: when Norman hides his wings, he suppresses his natural joy and happiness. As he smothers his wings under his coat, Norman’s world turns grey and distant; when he finds the courage to reveal his wings, beautiful colours explode once again from the pages. Adults and children alike will instinctively urge Norman to reveal his wings and take to the sky. I admit that tears pricked my eyes when I saw the children flying together, the symbolism evoking memories of feeling at odds with ‘acceptable normality’ during my own childhood. It is challenging for everyone, but in particular children, to be confident about their differences; they can feel very self-conscious and worry about what others may think. A child may try to hide things about themselves which they feel aren’t normal or conventional, in order to ‘fit in’. Bullying hurts the perpetrator as well as the victim. When a boy tries to pull Norman’s coat off, the illustration shows the obvious distress of both boys. Trying to conceal your differences is often more stressful than showing them. Norman eventually realises that it was the COAT that was making him miserable, and not the WINGS. Your differences are an important part of your identity; trying to hide these can make you feel miserable. Showing your ‘true colours’ may encourage others to show theirs too. There is no such thing as ‘perfectly normal’ – everyone is different in their own way – and no one is perfect. Sometimes when you’re very upset, you think or say things you don’t really believe (Norman wishes he’d never grown his wings following a run in with a bully). With the loving support of his parents, Norman feels able to show his wings again. He feels liberated and happy. By revealing his differences, other children feel more confident about showing theirs. When the other children show their wings, Norman has never felt happier. The reaction that Norman gets from his friends is a very positive one. Some children who summon up the courage and confidence to reveal their differences are not met with such understanding and support. Their peers may comment on those differences in ways that are hurtful, even if they don’t do it intentionally. Parents may wish to use the book as a starting point for a discussion about hurtful words and actions. What activities and games make you feel really happy? How do you think Norman felt when he tried to hide the things that made him most happy? If you could fly, where would you go? Would you ever hide your wings? How would you help a friend who was struggling with being different? What would you say to make them feel better? What do you think the world would be like if everyone was the same? Encourage your child to draw some black and white pictures of friends all acting/looking the same, and some colourful pictures showing a wide variety of activities and appearances.